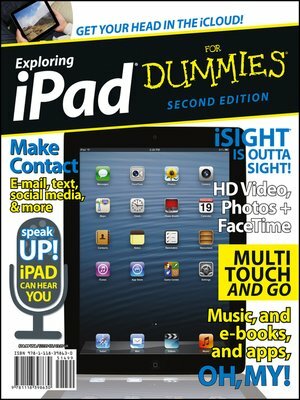 Get to know the incredible iPad in a uniquely different Dummies format! The iPad combines the best of your favorite gadgets into one amazing ultraportable touch device. And, thisone-of-a-kind For Dummies guide is your is your ticket for making the most out of your iPad or iPad 2. Thoroughly updated for the third-generation iPad, the new edition of this informative, full-color guide is packed with tidbits, full-color graphics, informative articles, and easy-to-follow step lists. Now that you have a new iPad, get to know it a little better with Exploring iPad For Dummies 2nd Edition. You've got the magic touch for all things iPad with Exploring iPad For Dummies 2nd Edition by your side.